The latest Test Kitchen ingredient to grace the pages of the blog was a package of steamed black-eyed peas by Melissa's, and the suggestions that came through when we posed it centered on an upcoming Southern tradition. You see, there is a dish celebrated during the new year as an indicator of good luck and fortune upon the eater if enjoyed on January 1st. 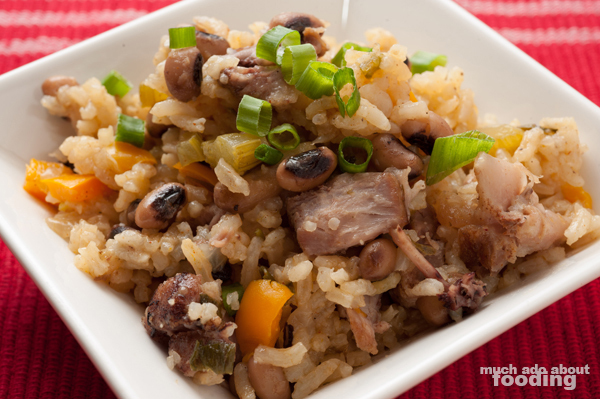 That would be hoppin' john and it is primarily a black-eyed pea and rice dish. How appropriate! So I got to reading about it and though the basic makeup requires just some onion, black-eyed peas, bacon, and rice, there is definitely more that can be added to make a superb one-pot dish for a whole lot to share. Check out the recipe and make some to bring prosperity to your friends and family! Cover the bottom of a dutch oven (or large pot) with enough vegetable oil to coat the surface and turn to medium high heat. 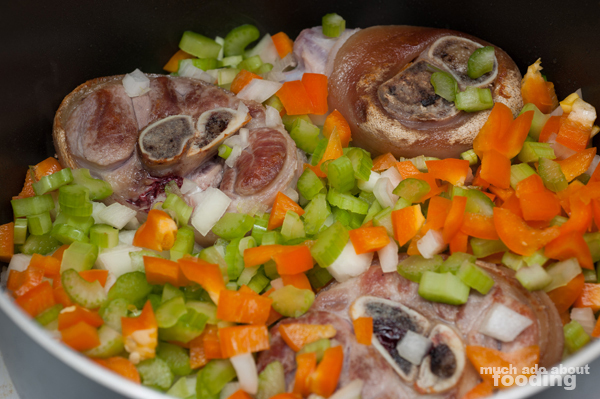 Place pork/ham hocks in pot and let it crisp up on all sides. Meanwhile, dice all vegetables. Once hock pieces have seared, add in celery, onion, whites of green onions, and bell pepper. 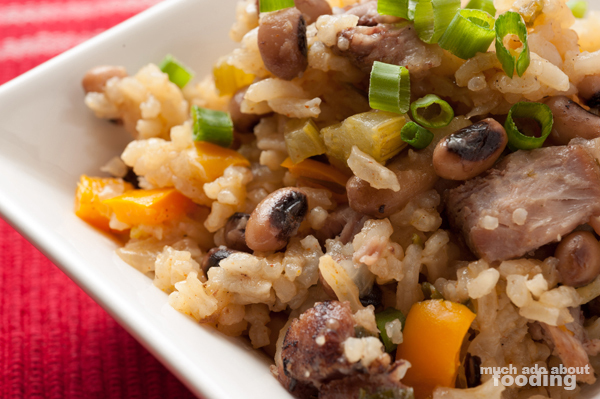 Some people serve their hoppin' john over rice but I wanted to bring it all together into a one-pot recipe. Add rice with blackening spices once vegetables start to turn translucent and let the grains soak up the vegetal juices. Add in garlic. Then add in broth and bring to a boil. Lower heat to a simmer and cover pot. Because the black-eyed peas were steamed ahead of time, they will be the last ingredient added so as not to turn them into mush. 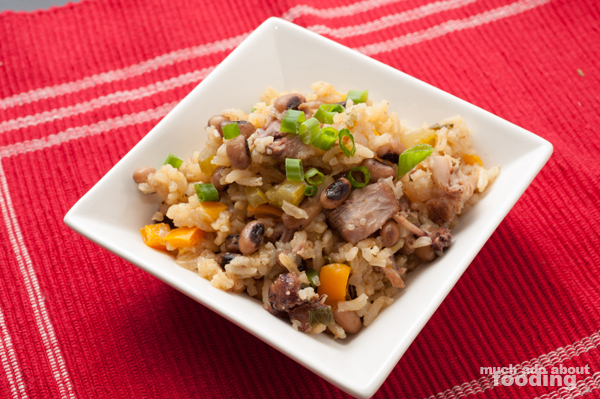 Once rice has cooked, gently mix in black-eyed peas and greens from green onions, saving some for garnish. Enjoy! 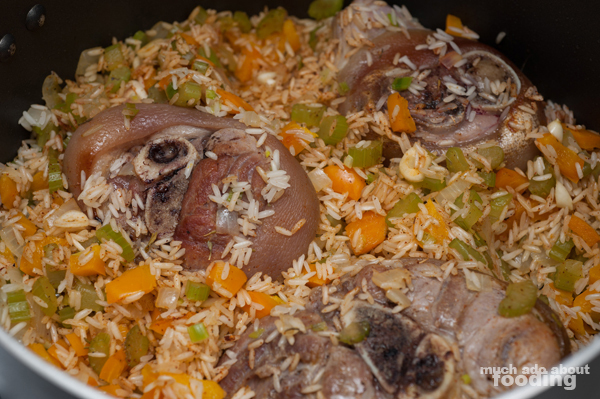 In the past when I've had wild rice, I had always enjoyed it but it wasn't something that crossed my mind as being an ingredient I would eventually cook. The mixture of colors in wild rice once cooked is so fun, and the textures make you want more. 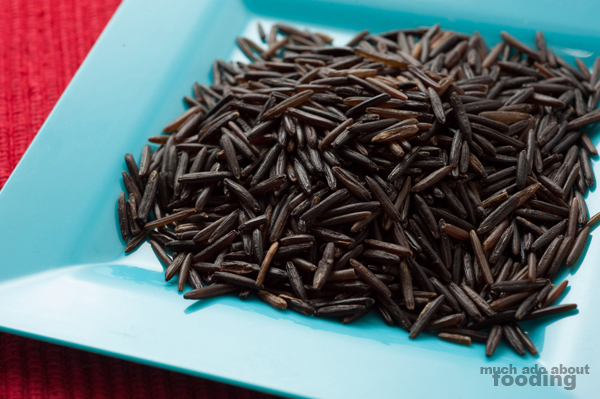 What are your thoughts on what we should do with the wild rice? Leave us your suggestions!